In order to maintain the safety at some buildings and attractions, turnstiles are used. These are typically made of metal and are of various designs depending on the kind of security that is needed. There are a few common places where you will see turnstiles. One is a government building and one is an amusement park. Most businesses will install turnstiles in order to monitor the number of people who enter the area and to make sure there is no one who enters the area who could be a danger to others. One kind of turnstile has an arm that looks like a triangle. This system allows one person at a time to enter the area. There is often a counter on the turnstile to keep track of how many people enter. Since there is only one person allowed at a time, this is a system that is commonly used at amusement parks and attractions. They can sometimes be used at government buildings to make sure only one person at a time gets into the building. This is more for safety instead of keeping track of how many people are inside. 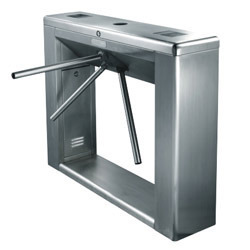 If you are concerned about the way the property looks, then consider an optical turnstile. There are no barriers. Instead, there are sensors that will allow people to walk through one at a time. There are systems similar to this that require those who pass through to swipe a card or use a fingerprint to gain entrance. These are ideal for offices. If more than one person tries to get through at a time, there is usually a signal that alerts security. Businesses that have valuable items inside often have systems that reach the height of most of the people who enter the building or that reach the top of the building. This is to make sure no items get out of the business that aren’t supposed to leave. A biometric system is often used in this instance so that only certain people are allowed to leave the building with the items that are made or sold by the business. Browse through pictures to see the designs of the turnstiles available to install.